The Wasted Penguinz are a hardstyle duo from Helsingborg, Sweden. The highly popular duo consists of two artists; Pontuz Bergman and Jon Brandt- Cederhäll. The Wasted Penguinz debuted in the prestigious DJ Mag Top 100 in 2012 at #75 and appeared again in the Top 100 in 2013 at #83. The duo have notably influenced the hardstyle scene with their fresh, new and euphoric sounds which can also be described as real emotions and experiences transformed into music. The pair have performed at major events including Tomorrowland, Mysteryland (NL), Defqon.1 (NL and AU), Decibel, Hard Bass, The Qontinent and Q-Base and have performed gigs all over Europe and have expanded to other parts of the world including Australia and Canada. 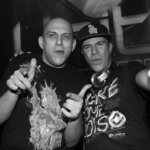 With their chart topping hits “Hate Mondayz”, “Resistance”, “Anxiety” and “I’m Free” being released in 2010, along with their largely popular and funny YouTube video blogs allowing viewers into their personal lives, this seen the duo explode into the hardstyle scene and gain one of the most dedicated fan bases and win Fear.FM’s “Best New Face” award for 2010. 2013 seen the release of the Wasted Penguinz hugely successful and highly anticipated album, “Wistfulness”, along with a number of single releases for festival anthems such as “Let’s Get Wasted” (Wasted Festival anthem) and “Island Refuge”, together with “Da Tweekaz” (The Qontinent anthem) and the single track release, “Raindropz”. The pair were also approached to produce the official remix for “Life is Calling” by EDM artists “JoeySuki and Kill The Buzz” which is set for release on Hardwell’s “Revealed Records” in 2014.